Standing still on the wrong side of an escalator during rush hour can often illicit angry glances from other stressed out travelers. But now, Transport for London (TfL) is attempting to shift this line of thinking in order to make one of their most crowded Tube stations more efficient. The Guardian recently reported on an experimental three-week trial run that took place at London’s Holborn station requiring all passengers to stand in place while riding the escalator. The goal wasn’t to annoy grouchy commuters, but rather funnel them out of the congested station at a faster and more efficient pace. While the idea may seem counterintuitive, concrete data exists to back it up. According to the escalator traffic laws unofficially recognized by subway commuters everywhere, standers must stay to the right side to make room for climbers to pass on the left. This system becomes less efficient when fewer people choose to walk, a factor that's directly impacted by the length of the escalator. With especially tall flights that are often found in subway stations, this leads to commuters reserving half the escalator for a minority of people, which causes more congestion. This phenomenon was observed in London’s Holborn station specifically, where one of the escalators stretches 77 feet long. According to The Guardian, a 2002 study of escalator capacity on London's underground railway system found that on escalators of about 79 feet (similar to Holborn's), only 40 percent of commuters would even contemplate walking instead of standing still—significantly reducing the escalator's efficiency. Further data modeling supported this theory. 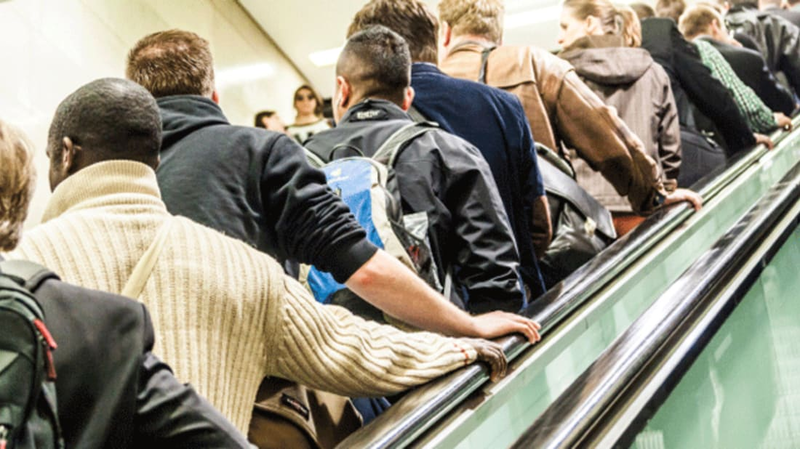 If all commuters were to approach the escalator at the same speed then stand still while riding it, an average of 31 more passengers would be transported per minute. The trial that took place at Holborn station was enforced by real-life employees instructing commuters to stand still, but if the rule ever becomes permanent, TfL plans to take a more high-tech approach: In place of a human being, a holographic customer service representative will be present to instruct people to stand on both sides of the escalator.